Living in a rural community can feel lonely and isolating. These feelings can be enhanced by fear of crime, whether it’s a real or imagined. Of course, this has a knock-on effect on our everyday worries and issues and can lead to a decline in our mental health. It’s important to remember there are charities out there that offer help and guidance. One such charity is You Are Not Alone (YANA). YANA has successfully raised the profile of mental health in rural communities. highlighting that it is ‘ok not to feel ok’. 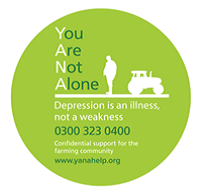 Yana is a confidential service and encourages those suffering from depression, stress or anxiety to visit their GP or contact the YANA helpline. YANA can fund up to six sessions of counselling and these can be arranged within days, compared to NHS waiting times of months.